Is it another exclusively Lebanese Advertising medium? I wouldn't know... but it sure stands out. 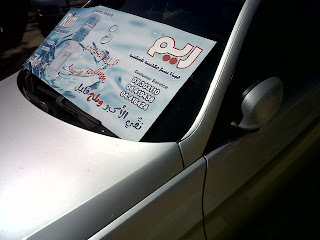 Lebanese advertisers know how to make use of every corner in our sight to place their logos. It's simple, it's useful, it's cheap. 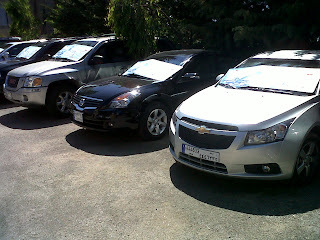 The same advertisement was printed on several windshield covers and were used by a restaurant's valet parking services to protect the cars from the sun heat... and who would object to that? That's pretty innovative if I do say so myself! Love it! That's actually pretty clever. I wouldn't want to find this covering my car if it's parked in the street, but if done by a parking valet and taken back, it's alright.